← The Man Boobz Troll of the Year Award for 2012 goes to … MRAL! No, that’s not a typo. 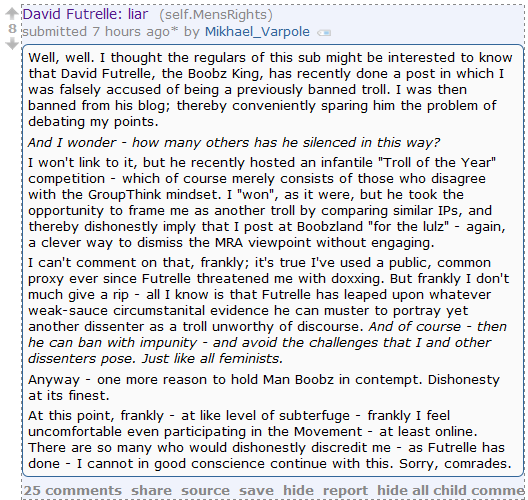 Posted in: antifeminism, MRA, reddit, top troll, TROOOLLLL! !, whaaaaa? It’s even more gendered when the assumed-female group says “we don’t like you, go away” and the attention-seeking dude responds with either “nuh-uh you can’t make me” or by just pretending he didn’t hear them. Yeah, the number of times people have confused me for female has caused some amusing troll U-turns in the past. (I was raped? Obviously I was just–oh wait, I’m a GUY. Uh. Well. HEY LOOK AN IDIOT! *flee*) Perhaps I should change my psuedonym to Butchy McMachoMan 3000, to get the point across. Yeah, it’s a very presumptuous, narcissistic thing to do. I don’t engage with trolls much at all, but grahhhhh. Not sure on the last part, there has to be a char. limit I would think. Enh, Sneak and Gigs never post here. Nobody in the system really does. They see my enjoyment of troll takedowns as a peculiar eccentricity to be indulged and ignored, much like Mac’s fetish for eighties dance movies. Hmm then…anything with a male pronoun could work. And Mac likes 80s dance movies?! I pity the rest of you. Yeah, I bought him ‘Dirty Dancing’ for belated Godbirth, and suffered through the yearly watching of it. Still haven’t forgiven him for the time he subjected me to a double feature of that and Flashdance at the theatre. Oh geez, that comes under the “patience of a saint” heading!